Debi Chaudhurani, Renuka. (March 2007 3rd ed). Rakamari Amish Ranna. 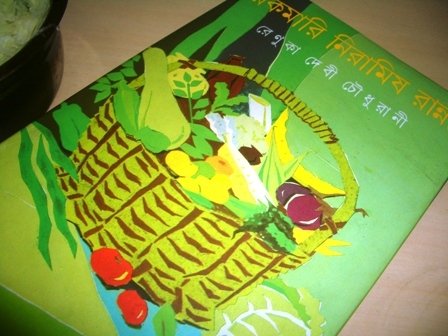 Kolkata: Ananda Publishers Private Limited (Ed. Sheela Lahiri Chaudhuri). Sheela Lahiri Chaudhuri’s brilliant attempt to bring to the forefront the non-vegetarian culinary delights of Renuka Debi Chaudhurani must have been exhausting and she does a commendable job by introducing the readers to the book in the introduction she pens down about her mother-in-law. In the introduction Sheela mentions that Renuka Debi Chaudhurani could not complete the manuscript before her demise in 1985. The editor also apologises for the missing gaps in the cooking methods and procedure in some recipes. Well, the book has been divided across 60 sections. Each section has a minimum of 5 recipes. The book will help you sail through 365 days of cooking non-vegetarian meals. The recipes collected from Renuka Debi Chaudhurani’s cookbooks reveal the galaxy of cooks from whom she had learned to cook. There are three sections which mention that the recipes are inspired and cooked the way Bawarchis usually do. In fact the most interesting section to my mind is the section on Meat Stews. While Stews on one hand had entered the Bengali palette during colonial times, and it was being cooked in Bengali households also indicate that the everyday cooking in Bengali upper middle class households might have colonial influence. This is particularly evident in the variety of non-Bengali Chicken/ Mutton recipes that Renuka Debi Chaudhuri pens down for us. Her East-Bengali lineage is evident in the Hilsa preparations and other fish preparations particularly the section on Fish Shukto. Infact the editor also draws attention to the culinary delicacies that Renuka Debi Chaudharni must have been drawn to considering she spent a considerable time in the then East Bengal. This collection moves beyond Bengal and actually gives us a glimpse of the recipes from North to South India which makes this an interesting read. Though I did try out some recipes from the section on prawns I am yet to enter my kitchen with this book. What I seriously miss are the cooking tips or the list of tips in kitchen which is there in the former book. Nevertheless the personalised introduction of Sheela Ray Chaudhury makes up for the missing anecdotes, and wit of our author Renuka Debi Chaudhurani. As I browse through the pages, and make a list of things to buy for a recipe I will cook for our Sunday meal, you take a pause and dawn on your chef’s act to get your act together. Choose from Fish to Mutton to Chicken to anything that catches your fancy and plan for that Sunday meal. Till then a glimpse from the cover page…. Debi Chaudhurani, Renuka. (Sep 2007 2nd ed). Rakamari Niramish Ranna. Kolkata: Ananda Publishers Private Limited. When I had started to pen down this blog almost a month back my first post was an ode to Julia Childe and I had said that its time to salute women who turned the tables around. I had also blogged about Beladi, and the prized possession of her cookbooks that are stacked neatly in my mother’s book shelf. Today I picked up another stalwart of the cookbook genre Renuka Debi Chaudhurani from whom many novices like me can cook without batting an eyelid. Renuka Debi Chaudhurani’s book “Rakamari Niramish Ranna” was first published by Surbarnarekha in 1988 and later it was taken over by Ananda Publishers Private Limited. 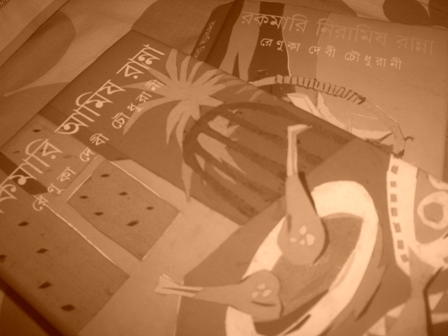 Till date it remains one of my personal favourite reads and guidebook as far as Bengali vegetarian cooking is concerned. About Renuka Debi Chaudhurani : From what we know from this second edition is that she was born on 31 July 1909 in Baghber, Maymansingh ( present day Bangladesh ). She was married in 1921 and moved to her in-laws house in Muktagachcha. Her husband was Dhirendranath Lahiri Chaudhuri who was the elected representative of undivided Bengal at the Central Legislative Assembly. The introduction to the volume of Rakamari Niramish Ranna is a social history of Bengal, and it moves between home and the world. She gives us a glimpse of her life under “purdah”, she gives us a glimpse of the political scenario and her wit is explicit in the way she narrates an incident about the famous cook Rudrada from whom our legendary author has learnt many a recipes. On one occasion when Sarojini Naidu and Pandit Jawaharlal Nehru visited her husband’s house in Delhi, Rudrada was the head cook of the Delhi household. Overwhelmed by the presence of two political leaders Rudrada made his way and told Pandit Jawaharlal Nehru, “Apnar Leg e Sir Amake Dibo. Desher Kaaje Amake Nen”. (If we literally translate, I am willing to work under your feet. I want to work for the country). Such anecdotes are a refreshing to the book. The richness of the book lies in the simplicity of the recipes and elegance of the cooking in itself. The book is divided into 35 sections and each section has almost close to minimum twenty recipes. The range of choices it offers to new generation cooks like me is as varied from “Poda” ( Roasts) to Poush – Parbone Pithe puli (Sweet dishes cooked during harvest festival in December ) to Jalkhabar ( Snacks). My all time favourite sections of this book remain Ghanta- Sukta- Jhol, Ghanta and Jhol. These three sections are dedicated to all of those who stare at the vegetable basket and rake their brains for hours to come up with an authentic Bengali vegetable dish. Cooking vegetarian food in Bengali through Renuka Debi Chaudhani’s senses seems like an easy task. Moment one hears Ghanta, one feels like running away from kitchen to hide as it reminds one of the dollops of ghee, garam masala that might go onto people’s palates but it is not quite so as the recipes indicate. What we learn from here is that “Ghanta” ( a should be pronounced as o) can be both spicy and non-spicy. And this is what makes it simple, easy to cook and something you can reproduce without venturing out into the market.In my house there is a close affinity towards raw papaya. Whenever I see that green vegetable popping from the vegetable basket in the refrigerator I try to keep it aside and wait for my stack of prawns. Today Renuka Debi Chaudhurani came to my rescue to produce a simple dish by the name Peper Ghanta ( Papaya Ghanta). For this recipe you would need:Grated Raw Green Papaya (500gms), grated coconut (about half-cup),Soaked Moon Dal (50gms)2 table spoon mustard oil, 2 bay leaf, 1 dry red –chilli, a pinch of Kalo jeera (three names for this black caraway seed/ black sesame/ onion seed)*, 2 green chilli,1/2 cup milk, 1 tea spoon flour. Salt and sugar ( as per your taste). 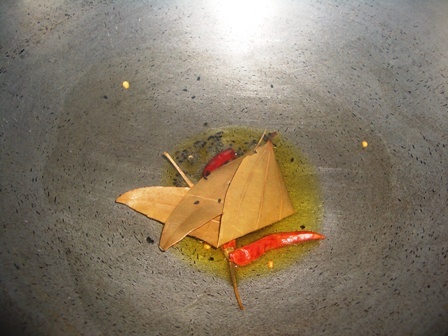 Take a kadai( wok) and add mustard oil. Let it bubble for some time and add dry red chilli, Kalo jeera*, and bay leaf . Once the aroma these ingredients hits your nose add the grated papaya and stir well. After that add salt and sugar and keep stirring nicely till it is semi-cooked. After that add soaked moong dal , add water and let it cook till the dal and papaya are cooked. There should be no excess water. To this add the mixture of half cup milk and flour and finish it off with grated coconut, 2-3 slit green chillies and ghee for that aroma. 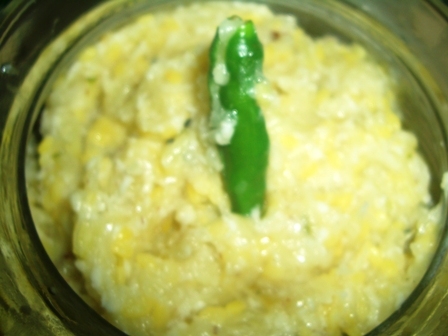 Serve piping hot with roti / parantha/ rice. The sociality of food becomes implicit and explicit in the way it contains and reproduces differences and sameness. It is in the production and consumption of food that social relations are reproduced across social structures. The social relations of food and labouring subjects go a long way. The social relation between the labouring subject and food is brilliantly captured in a film that I watched today in a film workshop called “The Lunch Box” by Floridne Devigne. The film maker embarks on a journey of Belgium’s social relations and revisits various tensions and contradictions through the prism of the lunch box and brilliantly weaves in the story of production- reproduction- and waste in the everyday life of Belgium. What struck me is the way in my work on labouring lives in industrial zones the army of workers entered with the three tier steel containers popularly known as “Tiffins”/ “Dabbas” (In Hindi). Growing up in an industrial township when the clock struck one, an uncle rang our bell to collect “Tiffin” which was neatly packed with Rice, Dal and Fish Curry to be ferried to my father’s workplace. Browsing through my field notes from Falta SEZ if one asked me to visually capture the army of workers entering the zone; the first image would be an army of workers either on foot or on bicycle with their three tier Tiffin Box entering the factory gates. Mostly women carried their tiffins as they felt shy to sit in canteens or walk back to the factory gate to have tea and snacks in the series of shops lined along the zone. The women workers usually carried their leftover lunch for the evening shift. In fact majority of the women preferred the evening shift from 2pm-10pm as they could cook lunch and carry food with them. Some of them carried their lunch to the workshops as they often got late doing household chores. Mostly women gathered in groups and shared their respective tiffins. While on one hand, mostly the unstructured interviews with women used to begin with what food they had cooked on the respective day it was not so for the men. Infact, for men, when they wanted to wind an interview particularly after morning shift they excused themselves by saying “Have to go… take a shower. I am hungry.” For women it was “ Need to go and cook both lunch and dinner. I hate morning shifts”. Men not only had the choice to sit for a meal which was already prepared they often ate in the roadside tea stalls lined along the factory gates. In my field work of three months I had never spotted a woman barring me and the respective owner’s wives who helped their male folk in cutting of vegetables in the shop. Even the women who helped in the shop had to cook in their respective homes before they reached the shop. While women managing tea shops and lunch stalls are a common sight, the customers remain mostly male. For instance, one of the shopkeeper owners through some arrangement with the security used to send his wife with a bag of 30-40 packets of Puffed Rice and Vegetable Fritters to the zone to capture the female clientele. During this field work, even my social relation with the workers came to be determined by food that I ate and consumed. For instance the very fact that I rested in a shop close to Falta Special Economic Zone where they prepared vegetable fritters to be sold to Zone workers; made me acceptable to a section of workers who were the patrons of this shop. Infact one of the contractors who had misbehaved with me in front of a factory gate actually apologised when he found me eating Dhakai Paratha with ghugni ( Dhakai Paratha is a layered paratha which is made of flour, and water. What is interesting is that it is shredded, and sold according to the weight). Ghugni is a popular Bengali breakfast of roadside tea stalls. The basic ingredient is Dried White Peas. We sat with our respective kanshi ( Bengal word for an steel / aluminium utensil with a shallow base usually used to have puffed rice) and discussed various issues relating to the zone and beyond. So Tiffins- not only represent a “break” of the routinised schedule of the labouring subject it is also a space where through the tiffin the labouring subject is able to gaze/ engage with the product of his/ her labour. Coming back to capturing everyday life through the prism of “lunch box” presents a materiality of political economic life which is both productive and reproductive. While on one hand the food that is inside your tiffin is the product of “labour” ; the labour also “consumes” the tiffin. It is almost as if the image of army of workers walking with tiffins point to the banality of work. It is this banality of social relations that we as labouring subjects produce and consume through food. If I want to revisit my momo memories in Nepal I want to own a perfect “Bazarer” bag to carry my fish purchases. A perfect “bazarer bag” can make all the difference in the kitchen. In Kolkata, despite the water-logging problem I grew up watching my fathers and uncles take out their rusted bicycles during rainy season with their “bazarer bags”. Anybody familiar with the kitchen set up of a Bengali household will find these nylon bags beneath the sink . Two bags are neatly hanged on two separate hangers. One dedicated for the amish( non- vegetarian) raw ingredients and the other for niramish bazaar( primarily the vegetables). Onions and garlic usually came in a separate cloth bag. As a kid my favourite subject for drawing competitions was Indian market place. In this pictorial representation of the “bazaar” I often drew a man standing next to a fish-seller selling fish of all sizes and kinds with a bag from where the greens would pop out and the bloated bottom of the bag had stacks of potatoes, and other vegetables. Though shopping malls and organised retail outlets have made an entry into the Kolkata, nothing can beat the vibrancy of walking through hordes of fish lined up in series of rows with enough space for the customer to stand, order and take the freshly cut fish in their “machcher bag”. Machch is the Bengali word for Fish. I always had a fetish for carrying the “fish bag” whenever I accompanied my father to “Manicktala Market” or “Rani Rashmoni Market” (two noted markets of North Kolkata). Our secret trips to Manicktala market was accompanied by a brisk breakfast of Kachori ( fried bread) and alur tarkari( potato curry) in a sweet shop by the name Thakurer Dokan in Rashmoni Bazaar, Beleghata. If you manage to reach the shop by 9.30 am one was sure to find some space in the bench which has been there since the inception of the shop. The Kachories are made of Biuli Dal and their Potato Curry is made with freshly ground ginger, cumin and secret touch of love. The un-peeled small cubes of potatoes are thrown into the big kadai and all the spices are added, with a generous touch of turmeric, adequate salt and a pinch of sugar to finish this simple curry which can never be reproduced in our kitchens. After having this brisk breakfast and packing two jalebis( fried Indian sweet) to satiate my sweet appetite we headed towards Manicktala Market– a paradise for the fish lovers. The enticing part about Manicktala market is the smell of various kinds of fish. Whenever guests came to visit us in winters I anxiously waited for my father’s approval to take me to the fish-y den; where fishes were sold and traded in thousands, and even more. My father believed that you could get Fresh Prawns ( Galda Chingri) at any time of the year in Manicktala and the best variety of Hilsa, Topse and Morola can only be found in Manicktala. My mother for all practical reasons hated when my father bought chotto mach (small sized fish) like Morola and Putti because it took her almost an hour to clean these fishes or to supervise the cleaning done by our mashi ( aunty who helped us with cleaning and washing). My best days would be when my father ordered Bhetki fish fillet.I used to stand next to my father with wide eyes watching the fish seller take out his bonti(curved blade rising out of a narrow, flat, wooden base) to attack the head and remove the scales and then with the swift move of a “fish- knife” ( unlike our fancy knives; it is a huge knife which looks like a ruler from a geometry box) he used to de-bone the fish and chop the fish fillets according to my father’s requisition. Like an inquisitive intern I used to imaginatively chop the Bhetki fish using my imaginary knife and then waited patiently for him to pack the fish fillets in a white plastic bag and the Bhetki Kanta ( leftovers from the Bhetki Fish) in a black polythene bag so that the “boudi” (meaning sister-in- law; my mother) could conveniently wash and refrigerate. Another separate small bag to carry the fish head to be cooked with Greens was neatly packed and given to us. As a kid I thought my mother and father knew these fish-sellers because my father used to coax him to clean the fish properly so that his “boudi” should not get upset. And often fish –sellers called out to the half-sleep “babus” who visited the bazaars by telling them “ Fresh machch niye jaan; boudi khushi hoben” ( Take fresh fish. Boudi will be happy). For a long time I wondered how the fish sellers knew what the boudis wanted in the kitchen. How could they sit miles away with their fishes and know whether boudis wanted small fish like Morola, shrimps to add to the saag ( greens) or prepare rohu/ katla jhol. This long distance relationship between the fish seller brother in law and the middle class bhadramahila boudi always fascinated me. These were the days before the mobile phones acted as the mediating device between the babu’s wife and the fish seller. Till one day I discovered the truth of this relationship when my mother was irritated with my father for buying some fish which she did not like she commented that my father’s brother ( i.e., the fish-seller) should stop from making assumptions about what his sister in law likes to cook. At this moment I interrupted and said that “You are being rude. He really likes you maa (Bengali word for mother). He often de-bones and removes the scales without charging a penny because he does not want to inconvenience his “boudi”. I thought justice was done. Well, this further aggravated the tensions. My mother was furious that my father had some secret talk about my mother’s non-preference for some fishes with a fish-seller. Time passes by. After completing my years of internship under my father I have attained the “eye”, “smell”, and “feel” of what a good fish could look like. Whenever I visit the slightly not too familiar yet close to a “bazaar” of my childhood in Delhi and the fish sellers assure me of the quality of the fish and often suggests recipes and packs the fish in plastic bags I miss the “Machcher” Bag of my childhood days. Every time I return home with packets filled with fishes I remember the ways in which my Rashmoni Bazaar fish seller in Kolkata would remind me on my way back to office to carry the Machcher Bag as he would be supplying me the best priced Bhetki, Topshe or Hilsa. I miss him. Everytime I prepare a checklist of things to buy from the market , I wonder if I would find a perfect machcher bag just like my childhood days. Last evening musing over my culinary journey in Nepal I fondly made a statement that “Everybody should visit Nepal to eat momos”. Nepal is a momo-maniac’s paradise. Having spent my formative years in bustling North Campus of Delhi University – which houses some of the city’s best and cheapest momo joints my taste buds were introduced to this delightful dish in a small Tibetan joint near Rabindra Sadan Metro Station Kolkata. When I moved to Delhi, outings with friends meant going for momos. I remember fondly our first visit from our paying guest accommodation on a fatal Tuesday evening to spare ourselves the torture of “Puri( fried bread) and Chchole(Chickpea curry)” all the way to Knags( Kamala Nagar) a shopping place close to North Campus, University of Delhi for a plate of momos with our seniors. Momo’s Point clearly has stood the test of the time. Many places have come and gone in this lane of Kamala Nagar but it has never matched to the popularity of this joint which is famous among people across ages in North Campus. Mostly frequented by students, Momo’s Point serves momos of three different fillings: chicken, pork and vegetarian. Though I have not tasted the vegetarian momoes because I think they taste the best in Kalimpong bus stand, a hill station on the way from Siliguri to Darjeeling rest of the momos are heavenly. The momos are served with a fiery red hot sauce. Momo’s Point is housed in a lane close to Mac Donald’s if you come from Hansraj side. Tell any rickshaw puller from the university that you want to go to Momos’s Point he would take you and drop you near Macdonald’s from where you will walk into a lane where either a cow or a bunch of flies will graciously greet you on your way to Momo’s Point. This lane is hugely popular among students. Though joints have come with Tandoori Momoes I like steamed momoes and Kothey (half steamed and half fried). If you want to taste a special sauce that goes well with momos; you have to visit Noodles nestled in the same lane as Momo’s Point. Along with the fiery red hot sauce they also serve a mild sauce which cools the hotness of the red sauce. As I finished a meeting with a group of colleagues and friends they decided to satiate my momo appetite they made me walk for 20 min to reach Dhokaima Cafe, Patan Doka nestled in the heart of Kathmandu and yet far away from the madding crowd. It sits pretty with open air cafe, a book store, an art gallery and even a bar. When you walk into Yalamay Kendra you enter a different world. And Dhokaima Cafe sits pretty with an old world charm. The official web portal of the cafe tells us that the building was built in 1920 and it was used as a store to a Rana’s palace. Well, one of my close friends from Nepal had told me that apparently he had heard from somewhere that the cafe actually used to be a horse stable. Well kings have various fancies and kings had horses so they needed horse stables. But whatever it was the cafe has been beautifully re-done by architect Siddharth Gopalan to reflect the old world charm. Even though their website menus does not mention of momos they do serve momos and some amazing fresh summer juices which are absolute heavenly. Dhokaima Cafe is a place where you can unwind your day with a plate of momos and your favourite drink. For details on Dhokaima Cafe visit the following link. So, it’s time when you are next in Nepal go beyond Thamel to Durbar Marg and Patan Doka to these two places to gorge on Momos. If you are a momo maniac and if you have the money and desire for momos give yourself a momo holiday in Nepal and combine it a trip with Pokhra to shred those extra calories. And for all those who made fun of my travel plans to Nepal for momos should remember that the most exciting historical voyages were about the trail for spices. So, momo maniacs it’s time we head towards the momo city of all times- Kathmandu. As Bengalis we love “Fish”. And Fish has also made its entry as a sweet. Well hold on to that cursor and google for fish shaped sweet and you are bound to come across the most common variety of sweets shaped like Fish as Tatwa items. Tatwa is the gift exchange ceremony prevalent among Bengali Hindus. It is a ritual of gift exchange on the occasion of marriage. There are primarily two sets of tatwa exchanges. The groom’s family sends the “Gaye- Haluder” tatwa marking the bathing of bride and groom is their respective native places where the groom’s family sends across Turmeric paste and mustard oil to the bride’s family. Along with this “Gaye- Haluder” Tatwa arrives where the Bride’s family is presented with gifts and sweets. Sweets occupy an important component of Tatwa exchanges and the artisans toil day and night for these special “Tatwa” Orders. Infact some of the web portals of the sweet shops have a separate section for “Tatwa” which indicates the market that Tatwa orders generate in the sweet market. Tatwa in contemporary weddings is more than gift- it is a leisure commodity so the “tatwa” products reflect the taste of the family, the status of family. In a recent visit to a family friend’s place, an elderly member commented how the “Phool shajya tatwa” ( gift exchange to commemorate the first wedding night of the couple. This gift comes from the bride’s family for the groom and his family members) from the girl’s family was from Nakur ( a famous sweet shop which only prepares “Sandesh” in North Kolkata). She recalled with pride that the owners of Nakur had specially come up with the idea of preparing something exclusive for the wedding. The exclusivity attached to Tatwa is shown in the way Tatwa items have travelled from Kheer sweets resembling Bengali Bride and Groom to Horse Pulled Tram, Reindeer, Shawl and of course Fish. So, Tatwa on one hand is more than gift exchange and on the other it also about the status of gift- giving family by gifting “exclusive” ly designed products (in these case sweets) and the social display of gifts by the gift –receiving family. In these exchange and display of gifts are the fascinating products that are created and the turnover generated through selling of “Tatwa” products. Hence all the giants of the sweet industry on their web portals have a special segment on Tatwas. Though there are many more sweet shops like K.C. Das, Hindusthan Sweets which have portals I am listing the three shops which have a separate section on Tatwa items. This shop was set up in 1885 by Ganesh Chandra Mullick in Bhowanipore far away from North Kolkata which was the hub of sweet shops. Late Ganguram Chaurasia migrated from a remote village in Varanasi, Uttar Pradesh to Kolkata in the 1880’s. He was a skilled Halwai and could make mouth watering Sweets. He took up a job in the shop owned by the then Raja Kamala Prasad Mukherjee and used to supply Sweets to the Rajbari. However, when the Government decided to evict the shop in order to construct a road, the Raja, pleased with his service, allotted him a small plot of land near Maniktola north Kolkata, from where the journey of Ganguram Sweets began in 1885. For the history and contact details refer to https://itiriti.wordpress.com/2011/07/30/sweet-biographies-of-bengal/. Some of the “exclusive” items: Prawns ( a set of prawns), Train, Swan Sitabhog, Swan Kheer, Shawl (sandesh carved to a shawl). Once upon a time a friend of mine had decided to abandon amish (non- vegetarian food) and become a vegetarian. It is a difficult task especially when you have friends who are carnivores and who will test your will power by ordering the chicken meal. In such trying times of transition this friend allowed himself occasionally to dig into the curry/ jhol of chicken dish. Whenever he held his spoon for a helping of chicken curry we grinned at our success. While garnishing my Alu Phulkopir Jhol ( A curry made of Potato and Cauliflower) with coriander I was irritated by the fact that I had run out of fish. Bengalis are self proclaimed Jhol (milder curry is called Jhol ) fanatics. We have jhols for every occasion. Jhol is part of our everyday cuisine. What is a Jhol? It is exactly opposite to “Indian” curry. It is a slow method of cooking where each Jhol has specifications for the ways in which we chop our vegetables, to the spices we add ( usually a combination of not more than two wholesome spices are added to Jhol). For instance for my favourite comfort food Alu Phulkopir Jhol you need to chop medium sized potatoes into not more than six pieces ( in cube shapes). While cutting the floret of the cauliflower you need to be careful while dicing so that you leave half an inch stem to each floret . After chopping them rinse the cauliflower thoroughly in hot water, boil them and keep it aside. Add mustard oil to the wok. When the oil bubbles, temper the oil with cumin seeds and dry chilli ( not more than 2 for 300 gm cauliflower). Lightly sauté boiled cauliflower florets and boiled potato cubes with a pinch of salt and turmeric and keep it aside. Add tomatoes, ginger paste and a generous dose of cumin powder ( my mother adds fresh paste of cumin seeds) to the oil and let it cook till the smell of masala blends with the oil. After this add the florets and potato to the masala; add water and let it cook for 15 min. Stir well, add a pinch of sugar and garnish it with coriander. If you want to add Fish (preferably add Rohu or Bhetki). Fry the fish and add it before finishing off with chopped coriander. We make similar Jhol out of Parwal ( Alu potoler Jhol). Instead of fishes like Bheki / Rohu Alu Potoler Jhol tastes best with fried de-veined shrimps. But the garnishing has to be of dollops of ghee and garam masala. Most of these gravies are light but the best one is which my mother makes after every grand feast. For her “Jhol” is a cooling agent. She cuts vegetables like Potato, Raw Banana, Green Papaya, Beans and Parwal into long pieces. She tempers the oil with Panchphoron (five spice mixture used in Bengali cuisine available in any supermarket) and then adds four green chillies, sliced ginger. To this she adds freshly made coriander and cumin seed paste (one table spoon each for 200 gms vegetable) She fries the paste for two to three minutes adds one and a half cup water , salt and adds the vegetables to this paste and cooks it for 20 min. She finishes the dish with roasted cinnamon and crushed peppers. This heavenly dish is a total comfort food and can be customised with the change of seasons. In summer you could add raw mangoes/ finish off with a generous helping of lime juice to add to the tangy flavour. In winter you could add some fried onions and ginger garlic to bring that hot zest. Jhols taste best with steamed rice. So what are you thinking? Dawn your chef’s hat and perfect the art of making a Jhol– comfort food for a “Bengali” soul. Last year when I got to know that India has won against Pakistan in the World Cup my cousin and I exchanged a series of messages on what our Buroda must have done. Buroda is the guardian angel of our area. Unlike our TV channels which has designated slots for news and debate shows; Buroda in his tea shop has a series of debates ranging from politics, sports and of course the Para-gossip (para is the Bengali word for neighbourhood). He is a storehouse of information. Buroda is all of 50 years old and my father called him Buro, my uncles buroda (da is the word for elder brother) and my cousins and yours truly call him Buroda. The universal Buroda is known for his butterly toast and milky tea. Buroda is a diehard fan of Argentina. He will take the pain to organise and hoist Argentina flags and make sure if a local club has displayed Brazil’s flag; he will spend that extra cash from his profits to buy a bigger Argentina flag. Buroda is a football fanatic, and he sells Tea. His speciality like any other tea shop in Kolkata is Crisp Butter Toast with dozens of sugar. In Bengali bread loaves are known as Paunroti ( at some point there was a believe that people used their legs to knead flour; hence paunroti). There are various shops lined in college street that sells crisp butter toast and tea on marble table tops. Apparently these shops used to be frequented by politico-ideologues of 70’s and 80’s . Coming to Buroda he also sells Ghugni, one of the most favourite snack and breakfast item for hundreds of migrant workers who work in the tanneries, and other industrial units in this industrial part of Kolkata. Like all industrial corners even Kolkata’s industrial sweatshops are falling prey to real estate developers and I was woken to a heated debate on how Buroda has also been victim of real estate players. Initially Buroda’s shop was housed under a thatched roof and a cemented slab which functioned as table and chair simultaneously. Buroda takes extreme care that his “female” customers like us does not have to enter his shop. He will insist getting our orders home delivered. Everyday Buroda looks at the highrise that stands tall and wonders at the by-gone era of 80s when his shop was thriving on the migrant Bihari workers and other workers who worked in the textile mills. He says those were the days. He never could make enough tea and there was never enough space. When somebody asks Buroda what led to his misfortune. He keeps silent. While I miss sneaking away to Buroda’s shop for my ghugni and paunroti for my breakfast I wonder who will be Buroda’s customers. Buroda himself laments that his customer profile has changed. Initially he was forced to keep Anandabazaar and Bartaman ( two leading Bengali Newspaper daily) now he could do with borrowing one. The customer profile of shops owned by Buroda’s across the city of Kolkata is mixed. People across classes and masses over the crisp toast and tea will lament on the souring inflation, debate on the political crisis that rocks the country. While shops like Buroda’s symbolise the pulse of the city of Kolkata; with the emergence of landscaped neighbourhoods it is a matter of time when Burodas will become a matter of memory. The only surviving grace is that Burodas never grow old in college canteens. One of the legendary college canteen in Kolkata is owned by Pramod da. Pramod da is equivalent to Baba Loknath to most of the Presidency students. Last time when I visited the college with a friend of mine, a former student of Presidency he treated us to his chowmein and tea. This special treat was in honour of a friend who had secured admission for her Ph.D abroad. My first tryst with “pub” dates back to one of the many book fairs in Maidan Calcutta .Now the venue of the book fair has shifted to a concrete park opposite to Science City. Kolkata was then known as Calcutta and Book Fairs happened in Maidan, the sprawling greenscape of city of joy where people go for picnics, walk, horse rides and of course romance. During one such Book fairs in Maidan, a group of friends were disgusted with the thought that I had not visited Oly. According to one of them, “If you are eighteen and you have not visited Oly you have committed a blasphemy”. Well I was eighteen; and more than that and had not visited Oly. So, they decided on a special day to take me to Oly. There I was waiting in Parkstreet “Fulurys” bus- stop ( most of the bus conductors call out Fulury’s Parkstreet once it hits the main junction of Parkstreet with Asiatic Society on one side and a Big Bazaar on the other. Alternatively you can take a cab to reach Parkstreet but considering this is the breathing, eating and drinking place of the city the city police have decided to do a little bit of traffic policing by making the street one- way at various times. Please check with Kolkata Police traffic before you venture out with your vehicle or you can brave a walk in the winters down Park street. Once you cross the Park hotel you have to walk down a little further and you will find the famous Oly Pub. A man sits at a desk and smiles at the regular customers guarding the groundfloor which is not meant for “Ladies”. You have to walk upstairs and hit the floor which at first sight will look like a class room with tables and benches. Once you turn behind you will see bottles of various shapes and sizes guarding the person who manages it and the waiters dressed in ceremonial white with red head gears greeting you and throwing the menu card at your face. People love it that way I suppose. Well so five of sat like school boys and girls waiting for our teacher to come and guide us through the food and menu. Without looking at the menu the waiter all in his mid-40s placed a small steel plate of Kolkata chanachur( savouries found in Kolkata) and rattled all that is available. From my friend’s cacophony I could hear two things Beef steak and Chicken Ala Kiev. Assuming that I was God fearing and abstained from beef a plate of Chicken Ala Kiev was placed in front of my eyes with a tumbler of 30 ml Vodka and a small tumbler almost equivalent to what we get in tea shops in Kolkata full of lime cordial. My friends I gathered were regulars as they exchanged pleasantries with the waiter. Those were the days when smoking was not banned. As I attacked the Chicken Ala Kiev with my knife the butter came oozing out and flowed over the beautifully done mashed potatoes with the exact amount of green peas and boiled carrots and created an aroma to die for. The scoop of butter inside the chicken breast neatly wrapped on a bone and deep fried was not only heavenly but visually refreshing after a long tiring day. The fact that you have to scream out to each other if you want to hear even your friend’s heart break makes Oly an adorable place. Another dish that Oly regulars die out for is their Beef steak. They always get it right. And it remains a miracle. The mystery and charm of Oly is that you are left to enjoy your drink and food as it is. And you will never have a bad day. Oly does not care about decor but their food touches your heart with the same affection that their ambience will create once you can appreciate the place. They don’t play music. People through their conversations, debates create new notations and you hear music. And if you become friends over Oly you are bound to stay friends. Oly reproduces a magic of food and drink full of raw emotions, love and pain. Next time when you are in Kolkata, stop by Oly, for that utterly butterly Oly experience with no frills attached. Every evening when I am left starved to satiate my appetite in a city of “chaats” I remember the rolls that Kolkata is famous for. In my recent visit to Bangalore I discovered a clean joint by the name “Kaati Zone” where I had ordered a Turkish Roll. A great place facing Church Street to wind up with your friends before you hit dinner. Prices are moderate for the simple decor and great food. Rolls of all sorts of fillings are available and vegetarians have a farely good option beyond paneer. But truly if you want to taste mouth watering rolls you have to come down to city of joy. A city which breathes and lives on street food – from phuchkas to rolls to city’s favourite invention “chowmein” and “chilli chicken”. This post remains dedicated to my all time favourite “Rolls”. What is a Roll? Th basic ingredients that are used for preparing this delicacy are : Flour, oil, salt and sugar. For the filling: Chicken pieces/ cubes, Mutton pieces/ cubes , Egg, Paneer, Mushroom, Fish tikka. If you know how to knead your flour for parantha (flattened fried bread) you know how to make a roll. The longer you leave and set it aside ; the better it gets. After that divide the kneaded flour into equal portions and take a rolling pin to roll it out on a flat surface. Shift this flattened piece of bread to a hot tawa. Add oil to the sides and fry both sides and keep it aside. For the filling use your imagination. For instance you can use some fish tikka, sprinkle a little bit of chaat masala, salt and squeeze a generous amount of lime and finish off with some green chillies to add that colour. But guess what tastes best, the Egg rolls that are piled up in mobile carts of street hawkers. They are the best. It is a sight to watch how these cooks play up with spatulas frying and tossing the paranthas and with the precision the egg yolk lands on the middle of the parantha and then is carefully spread out to the edges. The assistant cook then finishes off the dish with onions, cucumber, dollops of tomato sauce, dash of chilli sauce and if you are a regular customer he might advise you to stay away from tomato and chilli sauce and instead add the lemon zest which he must have squeezed for at least five rolls and finish off with green chillies. Nizam: Visit any of their outlets for the basic Chicken roll. Their bread is soft, yet crisp. They even have combinations like Egg Chicken, Egg Mutton, Double Egg Chicken and double Egg mutton Roll to satiate for people with a “hearty” appetite. Shiraaz: Almost similar to Nizam but their rolls are much thicker and can kill your appetite for dinner. So if you are single in the city and do not want to cook your meals pack a roll from Shiraaz. ZeeShan, ParkCircus: If you are by seven, you have to wait till 30 min before you make way for the counter where the guy sits patiently hearing almost everybody to hurry up. The juicy succulent texture of the fillings is a total pleasure to your taste buds. Nafeel, ParkCircus: If you are a beef eater, you have to try out the short and sweet rolls with well done beef chunks coated with secret spices from Nafeel owners. The rolls are of eight rupees and you have to have the heart to stand in the pavement and finish it off because of paucity of space in the shop. Dhaba, Ballygunge: Dhaba is a famous restaurant known for Mughlai food and it has the sumptuous rolls which are challenging to finish. Made with desi ghee it is quite a task to finish off a roll. Bedwin: Though Bedwin has various outlets spread across the city, the best one is of course tucked away in Gariahaat. Try out their fish tandoori roll. Alibaba: A new kid on the block with outlets spread across the city but their mutton rolls are quite a hit. Finally, Street side shops lined across New Market facing corporation building. P.S. And always remember Rolls are fun while you take a stroll and bite into it. You have to enjoy the experience of making your way with the roll neatly wrapped in the butter paper which has to be carefully unfolded with every bite while you make your way through the busy streets of city of joy.